Suggestions: Add a guide for each sublevel. 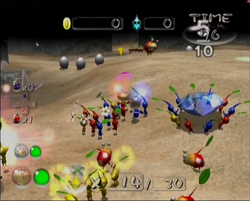 The Green Hole is the fifth level that is already unlocked in the Challenge Mode of Pikmin 2. The level difficulty is average, and it is possible to collect 20 small Bulbmin in the first sublevel. The challenge holds many species of Bulborb on the second sublevel. On the second sublevel, the enemies (except for the Fiery Bulblax) carry a treasure whose color matches their prototypical color. i.e. : the Dwarf Red Bulborb carries a red marble, the Dwarf Orange Bulborb ("Dwarf Blue Bulborb") carries a blue marble, and the Snow Bulborb ("Yellow Bulborb") carries a yellow marble.